Almost ten years ago, I bought and read Gerard Meszaros’ xUnit Test Patterns, Refactoring Test Code. It is very comprehensive and seeks to document all the common test design patterns. Meszaros uses italics to indicate named patterns, and I'll follow that convention here. The unit test framework I’ve used the most with .NET is NUnit. One quirk that I’m just beginning to understand better is the difference between Testcase Class and Fixture. My confusion lies with how NUnit requires that classes which contain test methods, be decorated with the TestFixture attribute. I always assumed that this meant the class was "the fixture", but no! The key thing is that while NUnit defaults to the Testcase Class per Fixture, you can do things differently. Take a look at one of the unit test projects from the Cake project. Notice how they’ve separated the Fixture classes and the Testcase classes into separate folders. 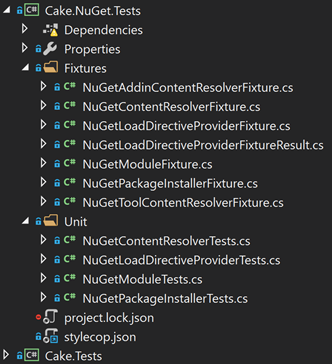 Here’s one of the test methods from the NuGetPackageInstallerTests class. Note how concise and uncomplicated it is. You can look at this method and very quickly understand what it’s testing. As described in xUnit Test Patterns, this Test Fixture has everything we need in place to exercise the SUT (system under test). It instantiates both the SUT and all its dependencies, and also provides helper methods that are called by the Test Methods. Without this, all of the setup and configuration code would have lived in the Testcase class (NuGetPackageInstallerTests). This looks like an example of the Transient Fresh Fixture pattern. If you want to get another perspective on using test fixtures, I’d also recommend taking a look at Mark Seemann’s Advanced Unit Testing course on Pluralsight.